The 15"x15" ( 38cm x 38cm ) SwingMan 15 is the best choice for the start-up business. Users will have unlimited application options; from youth size to adult xtra-large garments, and applications on substrates up to 1-1/2 thick. 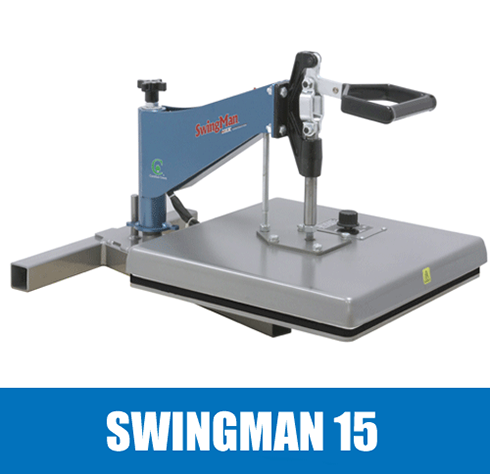 The HIX SwingMan 15 is one of the most reliable small format swing-away heat transfer presses on the market. At the heart of the SwingMan 15 is a 15"x15" ( 38cm x 38cm ) , lifetime guaranteed cast-in heating element with a swingaway design. Engineered with a sturdy steel design and the ability to apply all types of transfers onto items up to 1-1/2" thick. Easy adjustable pressure control, full range temperature settings from off to 205C, heat indicator light, and separate hand held digital timer is included. Portable at only 27 kgs. you can take your transfer business on the road. With this mid-sized swing-away press transfer applications are virtually unlimited; transfer to license plates, garments, mouse-pads, glass cutting boards, plaques, ceramic tiles and more! The SWINGMAN 15 is ETL certified. It has a lifetime warranty on the heating element.